Disclosures: Research funding / involvement in clinical trials (Ultragenyx, Shire) and sits on an Advisory Board (Sobi, Actelion, Medunik). No conflict of interest. Disclosures: Research funding / involvement in clinical trials (Biomarin, Ultragenyx, Shire) and sits on an Advisory Board (MedUnik). No conflict of interest. Affecting 2-3% of Canadians, intellectual disability (ID) is a lifelong, devastating condition defined by deficits in cognitive functioning (IQ<70) and adaptive skills (1). It is called global developmental disability (GDD) in children less than 5 years of age; it is defined as deficits in 2 or more developmental domains (e.g., fine/gross motor skills, speech and interaction). Here we use the term ID to cover both. In Canada, approximately 7,600-11,500 children are born annually with GDD (2). Associated co-morbidity is significant, and includes epilepsy, autism, psychiatric/behavioural disturbances, sensory deficiencies, and systemic organ involvement (e.g., congenital heart defects, liver disease). The etiology of ID is diverse and includes infectious, traumatic and toxic origins. However, genetic etiologies are the most frequent cause, demonstrable in more than 50% of patients, ranging from numeric and structural chromosomal abnormalities and submicroscopic copy number variants, to methylation abnormalities, and single gene defects. Given the rapid development of novel genomic technologies, the number of genetic etiologies being identified is steadily increasing. Because of the etiologic heterogeneity, diagnostic evaluation of children with ID is a challenge for neurologists, geneticists, and paediatricians. Current guidelines for the clinical evaluation of genetic causes of ID are based on frequencies of single conditions and yield of diagnostic methods and procedures (3); cytogenetic testing from chromosome abnormalities etc. However, causal therapy is not available for many of the conditions identified by this approach, thereby limiting any potential therapeutic benefit. Early diagnosis of individuals with genetic causes of ID that are amenable to therapy would not only mitigate the likelihood of brain damage, but also reduce the sequelae and associated health care costs. Inborn errors of metabolism (IEM) constitute a subgroup of rare genetic conditions for which an increasing number of treatments is becoming available. In 2012, we published a systematic literature review which identified 81 IEM –increased to 2014 anno 2015- that present with ID as a prominent feature and which are amenable to causal therapy e.g., medical diets, vitamins, medication, stem cell transplant (only 1 expensive drug) (4). The evidence created by our research has been translated into a two-tiered diagnostic protocol currently implemented in our institution, BC Children’s Hospital, as well as by pediatricians throughout BC, as part of a joint 18-month pilot initiative with Child Health BC in an effort to provide equitable access to the protocol for all children province-wide and evaluate its efficacy. Identification of GDD or ID in children is the essential first step and often a task for the primary care practitioner, who should refer the patient to a pediatrician or subspecialist in the community or academic setting for further diagnostics. The TIDE (Treatable Intellectual Disability Endeavor) protocol is designed for pediatricians, neurologists, geneticists and other childhood specialists, to identify treatable IDs at the outset of diagnostic work-up in at-risk patients, and was published as Recommendations in Molecular Genetics and Metabolism, (2014) (5). 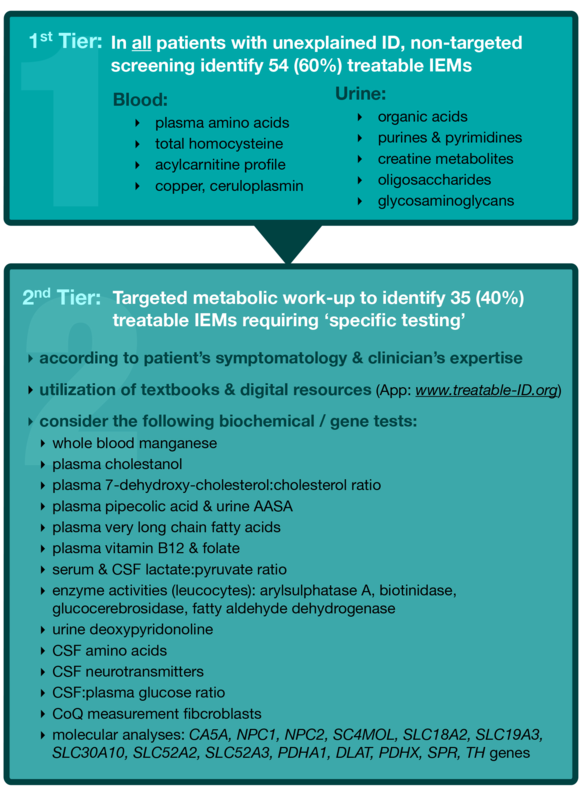 The first tier involves biochemical group tests, which potentially indicate 60% of the currently known treatable IDs. [Figure 1]. This first tier can and should be applied in all patients with unexplained ID, by community paediatricians and specialists, to effectively exclude a majority of treatable IEMs without referral to a specialised centre. Generally, these tests are provided by most biochemical genetics laboratories across Canada, with reasonable turnaround times and affordable prices. In BC, these tests are funded by the medical services plan for a total cost of approximately CAD $527.97 per patient (5). If so indicated the next step usually performed in an academic setting, is to apply the current diagnostic practice parameters for ID, as suggested by the American Academy of Pediatrics 2014 (e.g. chromosome micro-array, single gene tests, MRI, EEG etc.,) as standard diagnostic work-up(3), in combination with the second tier of the TIDE algorithm, for identification of the remaining 35 treatable IDs. These conditions require a ‘single test per single disease’ approach, including single metabolite or primary molecular analysis, which is designated as the second tier. The protocol is supported by a corresponding interactive website (www.treatable-id.org) and a freely available Treatable ID App (via www.treatable-id.org and the Apple App store as TIDE-BC App) (6). [Figures 2 and 3]. Since the literature search was published early 2012, new ‘treatable IDs’ and new treatments for known IDs have emerged as a result of gene discovery and/or clinical research, including but not limited to carbonic anhydrase VA deficiency (carglumic acid, sick day formula) (7) and the lysine restricted diet for Pyridoxine-Dependent Epilepsy (8). Consequently, we will continue to modify the guidelines to incorporate these and other exciting diagnostic and therapeutic advances as necessary. Recently we published a retrospective study showing cost- and time-effectiveness when comparing the treatable ID guidelines to previous practice (200-2009). (9) Further, we will publish the results of the TIDE study end 2015 as proof of principle; preliminary results indicate treatable IEMS in more than 5% of 500 study patients presenting with unexplained ID. Figure 2: TIDE-BC App home page (freely downloadable via the Apple App Store), including access to the Treatable ID App (via ‘diagnostic tool’ button). 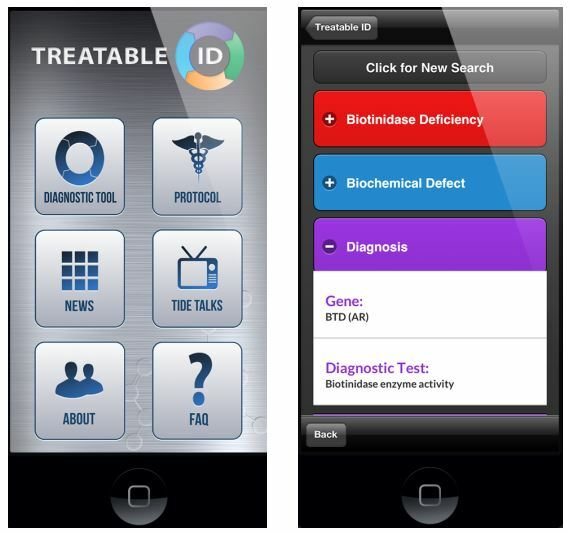 Figure 3: Example of a ‘Disease Page’ on the Treatable ID App.